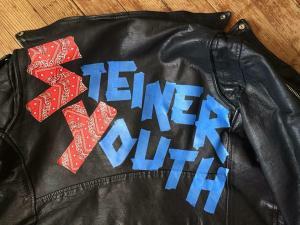 KEENE, NEW HAMPSHIRE – Meet Steiner Youth, a seven-piece, Southern New Hampshire band formed about a year ago, that cranks out a blend of classic, punk and progressive rock. It may sound like an oxymoron - youth plays classic rock - but if your heart is in the right place, that's surely all that matters. The band features Taylor Viles on lead vocals, Zach Dafeldefer on lead guitar and backing vocals, Griffin Temple on lead vocals, Cedar Gadbois on drums and percussion, Ben Galligher on rhythm guitar, Cy Willingston on bass and Tyler Bell on piano and keyboards. Although not all the guys always went to the same school, they all previously knew each other and in September of 2015 they all indeed, wound up in the same school and soon discovered that they all shared an interest in the same genre of music. Then, after someone suggested they start a band, the guys thought it was a great idea and started playing the music they all loved.